(Nanowerk News) Materials with chemical, optical, and electronic properties driven by structures measuring billionths of a meter could lead to improved energy technologies—from more efficient solar cells to longer-lasting energy-dense batteries. Scientific instruments such as those at Brookhaven Lab’s Center for Functional Nanomaterials (CFN) and the just-opened National Synchrotron Light Source II (NSLS-II), both DOE Office of Science User Facilities, offer new ways to study materials at this nanometer length scale—including as they operate in actual devices. These experiments produce huge amounts of data, revealing important details about materials. But right now scientists don’t have the computational tools they need to use that data for rational materials design—a step that’s essential to accelerate the discovery of materials with the performance characteristics required for real-world, large-scale implementation. To achieve that goal, what’s needed is a new way to combine the data from a range of experiments along with theoretical descriptions of materials’ behavior into valid predictive models that scientists can use to develop powerful new materials. Scientists have demonstrated a way to increase the chances of solving material structures by feeding data from multiple experiments and theory into a "global optimizer" that uses mathematical algorithms to narrow the range of possible solutions based on its analysis of the complementary data sets. 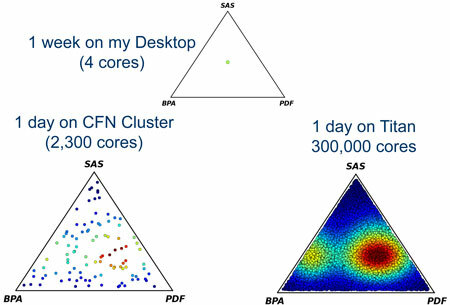 “There is a very good chance that expertise in high-performance computing and applied mathematical algorithms developed with the support of DOE’s Office of Advanced Scientific Computing Research (ASCR) can help us make progress on this frontier,” said Simon Billinge, a physicist at Brookhaven National Laboratory and Columbia University’s School of Engineering and Applied Science. At the SC14 conference, Simon presented a potential solution that makes use of mathematical theory and computational tools to extract the information essential for strengthening models of material performance. Powerful experimental tools such as NSLS-II make possible more intricate experiments. But ironically, some of the new techniques make the discovery process more difficult. 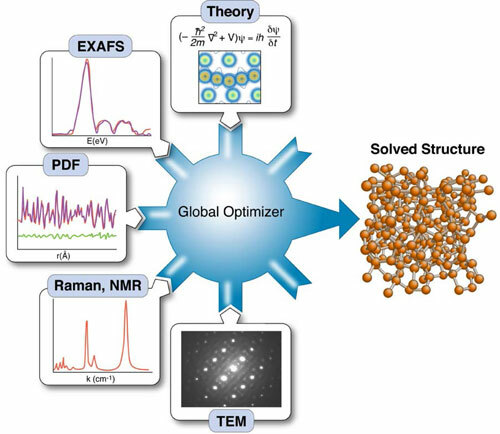 Finding possible solutions for a material's structure by global optimization of a model incorporating data from multiple experimental techniques is computationally expensive/time consuming, but must be done multiple times to check whether there is more than one solution compatible with the data. Each dot in these triangle diagrams represents a different way of combing inputs from the three experiments and the color indicates the number of structure solutions found for that combination (red being the most unique solution). Only when it is done for many dots can scientists zero in on the most likely common solution that accounts for all the data. It takes high performance computers to handle the scale of computation needed to give clear results. At the same time, the complexity of the models the scientists are trying to build to understand these materials is also increasing, so they need more information about those essential details to feed into the model, not less. Solving these problems reliability, given all the uncertainties, requires advanced mathematical approaches and high-performance computing, so Simon and his collaborators are working with ASCR on a two-pronged approach to improve the process. On the input side, they combine results from multiple experiments—x-ray scattering, neutron scattering, and also theory. On the output side, the scientists try to reduce what’s called the dimensionality of the model. Billinge explained this as being similar to the compression that creates an mp3 music file by shedding unessential information most people wouldn’t notice is missing. “If we reduce the complexity to minimize the input needed to make the problem solvable, we can run it through powerful high-performance computers that use advanced mathematical methods derived from information theory, uncertainty quantification, and other data analytic techniques to sort through all the details,” he said. The mathematical algorithms can put back together the complementary information from the different experiments—sort of like the parable about the blind men exploring different parts of an elephant, but now sharing and combining their results—and use it to predict complex materials structure. “Similar to an mp3 file, there is some missing information in these models. But with the right representation it can be good enough to have predictive value and allow us to design new materials,” Billinge said.